Invisalign is a system of straightening teeth without the use of conventional braces. A series of clear plastic aligners are utilized to create tooth movement. Moving teeth with removable aligners is not new. However, the computer program, which can generate a series of aligners with small changes is the new part. Invisalign is recommended for orthodontic situations with mild to moderate spacing or crowding. They are virtually undetectable, easy to use and comfortable to wear. Call us and setup a 1/2 hour Consultation to address your personal goals and objectives. Dr. Moore will examine your teeth to determine if Invisalign is an appropriate solution for you. Recommendations are made and a treatment plan begins to be made. We then discuss the duration of treatment and answer any questions you may have. A review of treatment cost and payment plan options is included. The next step is to schedule a Records appointment. 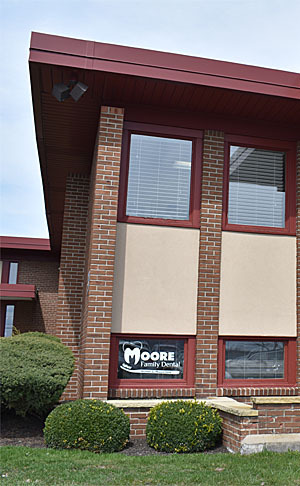 Appropriate x-rays, facial photos and teeth impressions are gathered for Dr. Moore to design your clear aligners. A $50 fee is charged at this appointment. Approximately 2 weeks later we will schedule a Review of the Digital Treatment Plan created specifically for you. This is a video animation of what Dr. Moore and Invisalign can do for your smile! It’s now time to commit and start treatment. Simply submit the brief form below or call us at 716.835.1670.